I’m going to refrain from adding to the “Italeave” analytical tourist chorus this morning except to reiterate the following. 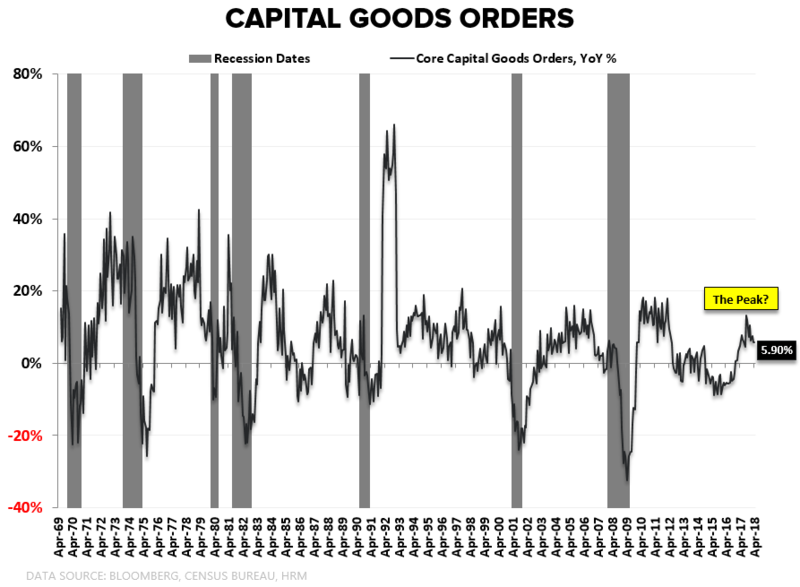 Growth remains the macro fundamental of import and its (protracted) acceleration serves to mask underling structural issues, allowing imbalances to build and risks to cumulate latently … and those latest risks have a stealthy tendency to become not so latent when the growth cycle inflects. Our #DollarBottoming and #GlobalDivergences calls are now 2 and 5 months old, respectively, and developing conditions across both the Eurozone and EM are just the latest manifestations of those realities. Indeed, our call on the $USD was born out of the Global Divergences theme with the expectation that Dollar demand could find some durable support amidst an improving relative growth outlook domestically as Eurozone/U.K./China/EM growth slowed both absolutely and relative to the U.S.
And the derivative implications for EM and weak-hand Eurozone economies were relatively straightforward. The risk for EM was that organic deceleration would be amplified by asset price deflation, capital flight and a rising sovereign cost of capital in what (always) carries the potential to propagate into a reflexive, self-reinforcing dynamic capable of metastasizing up the EM quality hierarchy. This was all already in conspicuous motion across Carry Trade vehicles and the weakest EM hands (Argentina, Indonesia, Turkey) as country specific risk collided with negatively shifting macro Fx/Rates dynamics (i.e. U.S. rates and Dollar up) even before Erdogan attempted to go full autocrat and Reinhart fanned the capital outflow flame with her “increased fragility” comments. That same risk – i.e. organic deceleration exacerbated by asset price deflation, a rising sovereign cost of capital and rising prospects of negative, reflexive price action – now characterizes Italy with a short bridge to the peripheral eurozone economies. Is it surprising that small caps (i.e. domestic exposure) outperformed nicely amidst the carnage yesterday? 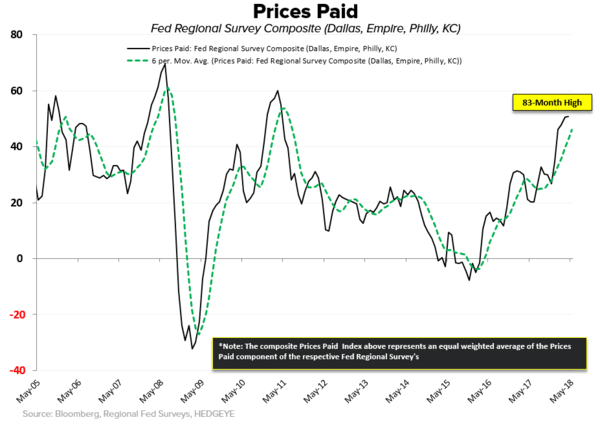 Anyway, we got the last of the Fed Regional Survey’s for May yesterday and the latest data serve to underscore the Growth and Policy Divergence dynamic. 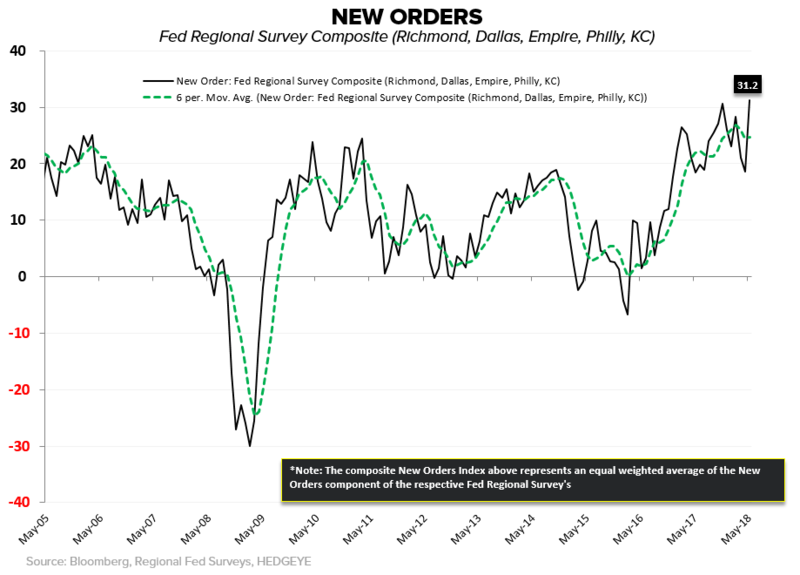 New Orders: The New Order composite rebounded significantly in May, breaching new cycle highs. The gain augurs positively for next week’s ISM data and forward industrial manufacturing activity. Capex: The Capex Plans composite continues to moderate off of 4q17/1q18 highs and accords with the multi-month deceleration observed in Core Capital Goods Order growth. 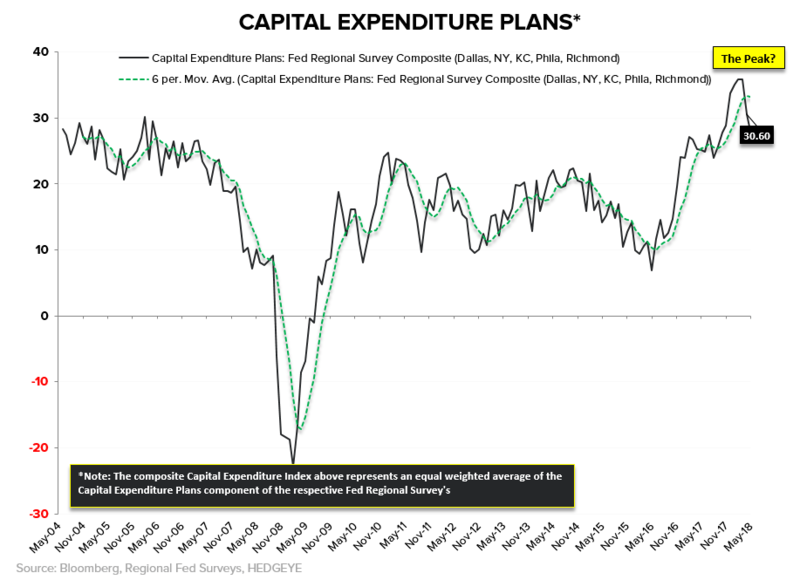 The ongoing “failure to launch’ with respect to capex in the wake of tax reform, a rising cost of labor capital and improving capacity utilization continues to confound consensus, but as we’ve rhetorically quipped: Does it makes sense to ramp investment into a slowing growth environment, late in the cycle and when wage inflation (finally) looks set to progressively drive margin erosion? Perhaps you don't fully cancel plans, but is it irrational to see them moderate instead of accelerate? But (& here’s what’s incremental relative to shifting $USD dynamics)…..
Everything OUS is worsening on both an absolute and relative basis so #DollarBottoming is still bid. While inflation expectations may moderate alongside energy/commodity price growth moderating and global growth slowing more discretely → which in turn takes some of the juice out of both the prospects for further increases in nominal/real yields and a proactive/over-aggressive Fed policy trajectory …. 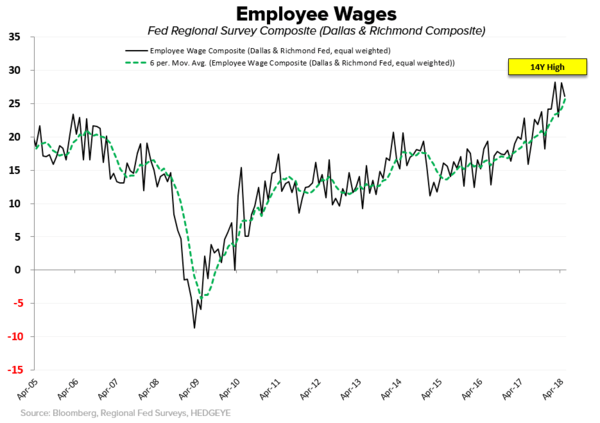 a rebound in May ISM’s and a strong 2Q headline GDP print may amplify the U.S. vs OUS Growth Divergence at the same time that Draghi may be forced to rhetorically or tangibly walk back the Taper timeline which would have the effect of amplifying and/or recharging the Policy Divergence vector. Both of which would be $USD supportive, fully baked with the attendant implications for EM et al. (even in the absence of a further march higher in inflation expectations which has hereto been a defining characteristic/driver in the prevailing factor flow detailed above). As Keith highlighted this morning, the intermediate-term @Hedgeye TREND support for the 10yr = 2.85%, so Mr. Market is dancing on that critical level now ahead of the next inflation catalyst in AHE on Friday. Trendspotting: Will Millennials End Up Worse Off Financially Than Their Parents?